Currently, I am a postdoctoral researcher at the Institut de Planétologie et d’Astrophysique de Grenoble (IPAG) working on star formation and astrochemistry with Sébastien Maret. My work is part of the CALYPSO (Continuum and Lines in Young ProtoStellar Objects) IRAM large program (PI Philippe André), which deals with the modelling and interpretation of an extensive set of observations of young solar type protostars obtained with the Plateau de Bure interferometer (PdBI). My most recent project aims at probing the CO and methanol snow lines in these very young protostars. We use this information to draw conclusions about the chemical and physical structure of the envelope, the physics of ice depletion and sublimation, and the history of the accretion process. I did my PhD at the Argelander-Institute for Astronomy (University of Bonn) in the group of Frank Bertoldi. During my doctoral studies I was a member of the Bonn-Cologne Graduate School of Physics and Astronomy (funded through the German Excellence Initiative) and the IMPRS for Astronomy and Astrophysics. My main research topic were shocks in the interstellar medium, with a specific focus on shocks in dense molecular clouds. In a theoretical modelling project, I investigated how molecular line emission is affected by grain-gain processing in interstellar shocks. In another observational project I used these shock models to interpret observations of molecular line emission from supernova-shocked molecular clouds. Shocks are ubiquitous in the interstellar medium (ISM), occurring whenever large pressure gradients lead to fluid-dynamical disturbances that move at a velocity that exceeds the local sound speed. As shocks dissipate kinetic energy into heat, they give rise to strong cooling radiation that constitutes excellent diagnostics for the study of the conditions in the shocked gas. The interpretation of this radiation requires the application of detailed numerical shock models. Grain-grain processing has been shown to be an indispensable ingredient of shock modelling in high-density environments (Guillet et al. 2007,2009, 2011). However, an analysis of the effects of shattering and vaporization on molecular line emission had remained open. I developed a new method for implementing grain-grain processing into a 2-fluid magnetohydrodynamic (MHD) shock model, which includes a self-consistent treatment of the molecular line transfer. Shattering was shown to have a strong influence on continuous MHD shocks for a broad range of shock parameters: the shocks become hotter and thinner. The consequences of these changes for the molecular line emission of shocked gas, with main emphasis on SiO which is released into the gas-phase by the vaporization of grain cores, were presented in Anderl et al. 2013. In a second project, MHD shock models were applied in the interpretation of observations of supernova remnants (SNRs) interacting with molecular clouds. We obtained new CO rotational line observations with the APEX telescope from shocked regions in two of these SNRs, W28 and W44. The integrated CO intensities observed towards positions of shock interaction were compared with a large grid of MHD shock models. Based on these models, it was possible to constrain the physical and chemical conditions in the shocked regions and quantify the momentum and energy injection of the SNR into the ISM (Gusdorf, Anderl et al. 2012; Anderl et al. in prep.). Besides these two main projects on interstellar shocks, I have been participating scientist in the NANTEN2 Submillimeter Observatory (Pampa la Bola, Chile) and performed observations and technical maintainance in 2008 and 2009. During my first stay we performed observations towards dense cloud cores associated with the supernova remnant RX J1713.7–3946 (H. Sano et al. 2010). Since 2009 I have been involved in the Herschel open time key project ‘Herschel M33 Extended Survey (HERM33ES): star-formation interplay with the ISM’. Aiming at a better understanding of the cold dust component in M33 we applied for observations with the LABOCA instrument at APEX at 870µm and were granted 44 hours observing time. The analysis of this data is still ongoing in collaboration with Marcus Albrecht. My diploma thesis at the ‘Zentrum für Astronomie und Astrophysik‘ (Berlin Institute of Technology) was about “Nonlinear dynamics of cosmic masers“, supervised by Erwin Sedlmayr and Eckehard Schöll (Institute for Theoretical Physics). During my studies I was supported by the German National Academic Foundation. 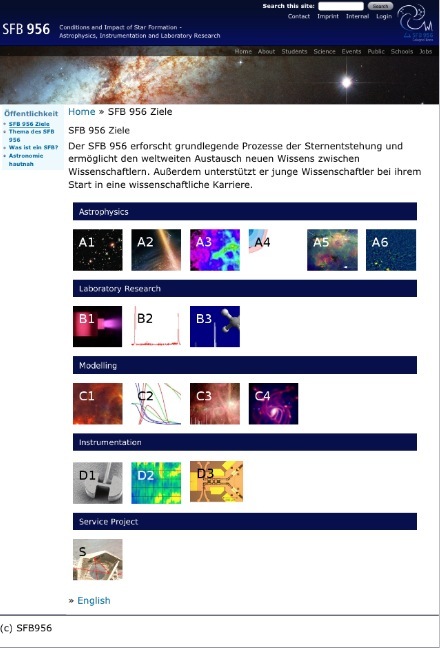 Für den Webauftritt des DFG Sonderforschungsbereich 956 “Conditions and Impact of Star Formation” habe ich 2013 die Forschungsthemen, bisherigen Ergebnisse und noch offenen Fragen aller 17 Teiprojekte aufbereitet. Zu jedem Teilprojekt wurde in Zusammenarbeit mit dem Videoredakteur der Universität zu Köln ein Interview-basiertes Video erstellt. Außerdem finden sich auf der Seite allgemeinverständliche Zusammenfassungen der jeweiligen Forschung auf Deutsch, sowie fachlich anspruchsvollere Zusammenfassungen auf Englisch. In 2013, I summarized the research of all 17 projects of the CRC 956 “Conditions and Impact of Star Formation” for a uniform presentation on the CRC’s webpage. For each project, I produced an interview-based video in collaboration with the video editor of the University of Cologne. Furthermore, each page contains a German summary of the respective research in layman’s terms as well as an English summary oriented towards scientific readers.